I have noticed extreme ghosting of objects when zooming in or out when working in large real world scales. This ghosting stays on the screen until you scroll the objects off the screen and back again or if you place another program window in front and then go back to Inkscape again. I am working in large scales (page 50m x 50m) and many objects of around a 1 - 3 metres in size. I also have to move objects many tens of metres across the page. I have provided screenshots of the issue. This issue doesn't occur when working on standard page sizes such as a4 etc. But I want to use Inkscape to layout tens or hundreds of real world size objects on a real world sized page. To reproduce the issue make a 50m x 50m size page and then make two rectangles at the top left and try zooming in or out. This issue is a major bug for anyone working in real world type sizes that makes Inkscape unusable. I hope it could be fixed easily. Please add information about OS/platform to the bug description. If on Windows, please add details which installer or archive was used to install Inkscape (32bit|64bit, msi|exe|7z). 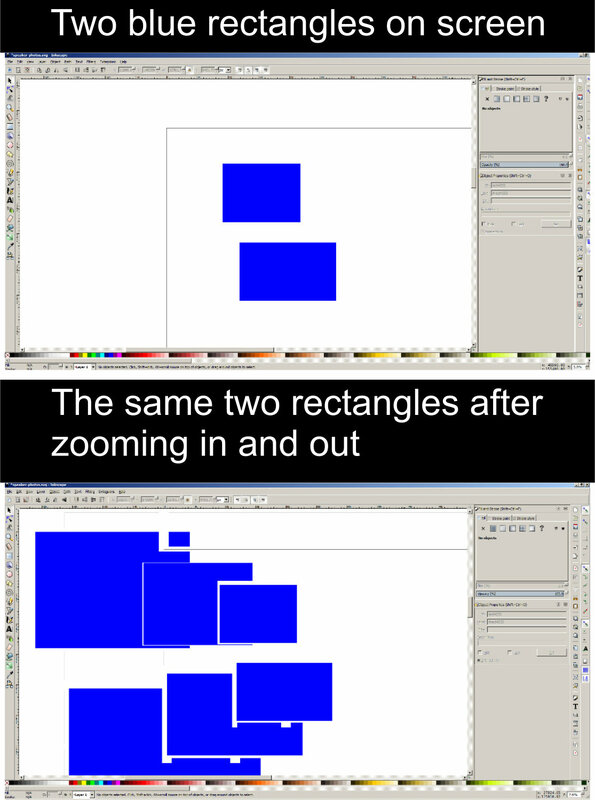 If the reporter uses Inkscape 64bit on Windows: try hiding the rulers - this likely improves rendering performance and reduces the amount of tearing when panning the canvas. Although I have also tested on Ubuntu using Inkscape .48.4 and have the exact same problem. I tried without the rulers in windows but it didn't seem to make any difference, at least it wasn't noticeably any better. The area where a custom background colour is/was limited to in 0.48. Yes that's right, I tested it. I need it to be bigger. Although there are work around such as making everything smaller by moving decimal points, maybe an inkscape programmer/developer could fix this issue easily by changing a line or two of code? With 'excludes' you mean if the visible portion of the canvas area in the current document window is outside of that 16000x16000px rectangle which colors the background area ? And only then these rendering glitches occur? Yes. Even that square's edges have problem with "screen clearing" when the zooming target is outside that square. Also reproduced on Crunchbang Waldorf, Inkscape trunk rev. 13922. Also appears in Inkscape 0.92pre2 15127. Tested on Inkscape 0.92.0 r15299(win64) ghosting appears outside the +-80000 px coordinates, when zoomed in more than 100% on the test file. Zooming in less than 100% the problem doesn't show up.